Marian Bernice (Jarvis) Little, 97 of Kell, passed away Monday, April 8, 2019 at SSM Health Good Samaritan Hospital surrounded by her loving family. Marian loved life and loved the Lord. She enjoyed many things, loved to laugh, loved crafts, knitting, crocheting, and most of all being a homemaker for her family. She will be missed by all who knew and loved her. Per Marian’s wishes, cremation rites will be accorded and a graveside service for Marian Bernice Little will be held Friday, April 12, 2019 at Hillcrest Memorial Park Cemetery in Centralia at 11:00 am with Pastor Shannon Bopp officiating. In lieu of flowers, memorial donations may be made to the American Cancer Society and will be accepted by the Sutherland-Garnier Funeral Home 235 North Sycamore Street Centralia, IL 62801 (618) 532-3523. 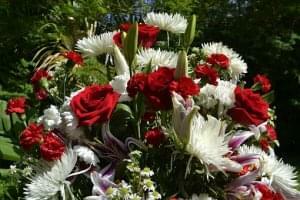 Online condolences may be made to the family by visiting www.sutherlandfuneralhome.com. Those who survive Marian are sons David Little of Centralia, William Earl Little and wife Nancy of Burlington, Iowa, Robert Neal Little and wife Karon of Waco, Texas and Daniel Ray Little and wife Darla of Jacksonville, North Carolina and numerous grandchildren, great grandchildren and great-great grandchildren. She was preceded in death by her husband Robert Earl Little, and son Richard Lee Little, her mother and father Ida Alma Jarvis and Edward Thomas Jarvis. Marian was born on December 18, 1921, the daughter of Edward Thomas Jarvis and Ida Alma (Luecking) Jarvis. She married Robert Earl Little on April 8, 1940 and he preceded her in death on November 16, 1987 after 47 years of marriage.